I was taking a peek at this post to help me sort out our garden just a little bit more. Since we are going REALLY big this year, I am trying to be REALLY organized. I had forgot the name of the website we use to find out when our seeds should be sown – glad I wrote it here! I thought you might be interested in having a peek at this one too. If you have been here awhile you might remember it from last year, and if you do – maybe you could get a little sentimental with me looking at how tiny my little ones were! This year it seemed as though Spring may not come at all. It is now the middle of April, and snow can still be found in our backyard. But the days are becoming increasingly warmer and my kids are becoming increasingly muddier … yes, I do believe Spring is coming after all. 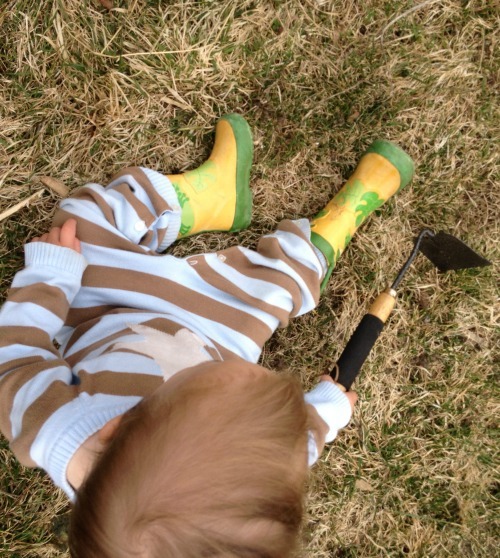 Which means it is time for gardening activities for kids! One of the many (many, many) reasons I love Spring is that we get to prepare our vegetable garden. The time finally came last weekend for planting our seeds – and so our yearly gardening activities for kids officially began! 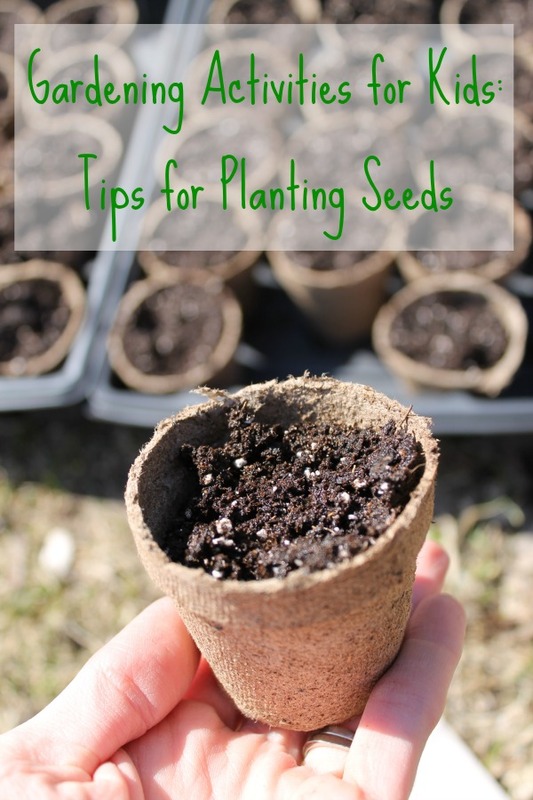 We start our seeds inside to give them a bit of a head start, our growing season is rather limited and we want to get every ounce of gardening we can out of the season! We planted these seeds with our little ones – and it went very well. We changed a few things from when we planted last year, as that seems to be how we learn best, trial and error. I thought I would share what worked for us, as maybe it will work well for you and yours? To begin planting seeds with kids, I got everything we would need gathered and ready while my little ones played outside. I mixed the soil with some water and put it in a big bucket. Last year, the watering of the seeds became an issue with too much water being added and little seeds floating. Pre-mixing the soil went much smoother. For me and the seeds. Next, the kids took turns scooping the soil into the little cups. We spaced the tray for holding the cups a little bit away from the bucket of soil, which was just the right amount of space for one to fill their cup, while the others walked and placed it into the tray. This limited the waiting and gave everyone time and space to enjoy what they were doing. Once the cups were filled the kids went on a hunt to find some sticks. This was a nice break for my littlest, and we spent a bit more time than I expected exploring before finding the “perfect” stick for poking. Next, the kids poked 3 holes in the dirt of each cup with their sticks. And of course, I use the number 3 very loosely. Some cups got riveted with holes, and others got skipped … but we tried. Finally, each of my little ones got to put some seeds in the holes. At this point in the game, my 18 month old had lost interest, and was back to exploring some sticks, but my 3.5 year old was still very much into planting the seeds. Since both the pepper and the tomato seeds were so tiny, it worked best for me to give him a few seeds spread out on a tray. He was able to pick up only one seed much easier this way. ~ As a side note – we are trying seed tape this year for our carrots. Such a brilliant invention! And this year we were able to find organic seed tape. We put three seeds into each cup, hoping we will have one successful seed out of the bunch. And, of course, we did many extra cups – just to be sure. 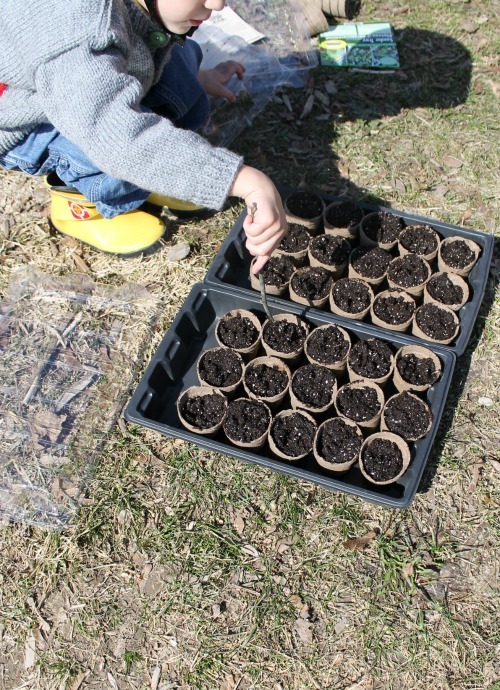 Planting seeds with kids is a wonderful learning activity. It is amazing to make something grow! And watching it through the eyes of my little ones reminds me of how amazing nature truly is. This is well worth the accidental 10 seeds dropped into one hole, and the 1 hour seed planting due to the impromptu nature walk to find sticks. Well worth it indeed.